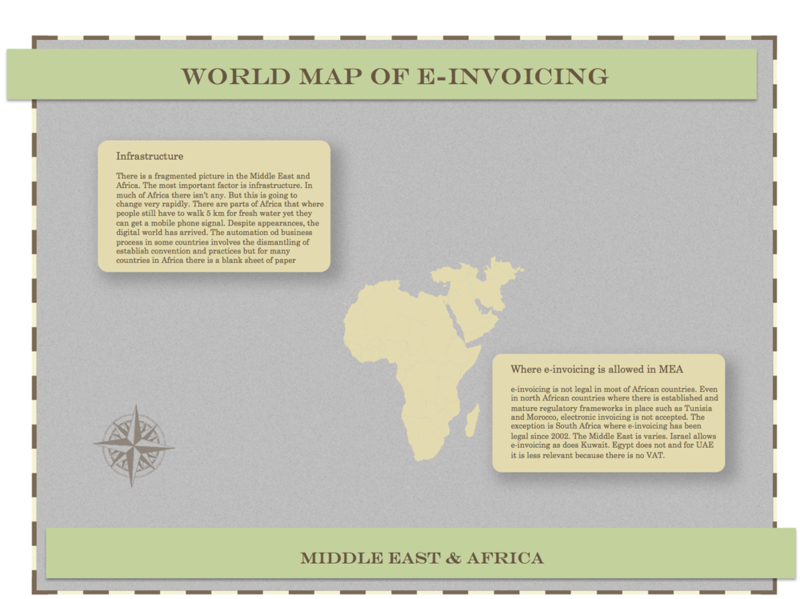 On the world map of e-invoicing, the Middle East and Africa are the most interesting. Within this region, there are very few countries that allow it but the reasons why this is the case and how we extrapolate those reasons to predict the future, gives us a view of a fascinating future. e-invoicing is not legal in most of African countries. Even in north African countries where there is established and mature regulatory frameworks in place such as Tunisia and Morocco, electronic invoicing is not accepted. The exception is South Africa where e-invoicing has been legal since 2002. The Middle East is varies. Israel allows e-invoicing as does Kuwait. Egypt does not and for UAE it is less relevant because there is no VAT. The most important factor for the absence of e-invoicing is infrastructure. In much of Africa there isn’t any, at least not as the West would understand it. The Democratic Republic of Congo for example, right in the heart of the continent, is bigger than Western Europe, yet it has less paved roads than Ireland. But despite this, the digital world has arrived – big time. It is a paradox. There are parts of Africa where people still have to walk 5 km for fresh water yet they can get a mobile phone signal. How is it, that for decades, it’s not been possible to deliver basic services like running water and electricity to Africa but a mobile phone network can be built? Is it that Africa values the telephone more than water? Or is it all about money? Well it’s neither. To understand this from the outside, imagine for a moment that the internet was turned off for a day. Really, imagine there’s an internet switch somewhere and it’s turned off. There’s no backup. No friends or neighbors. No internet cafes or library. No contingency. Really imagine it. Then imagine what you’d be prepared to do to have it switched back on. Telecommunication networks are extending their reach so aggressively in Africa because they are a critical communication channel. Mobile phones aren’t a way to chat in Africa. They are, to many African’s, the only way of accessing the outside world and, importantly, the internet. The impact of Africa as an economic power could be dramatic. Whereas the automation of business processes in some countries involves the dismantling of established conventions and practices, which can take time, for many countries in Africa there is a blank sheet of paper. Vast amounts of raw materials, an insatiable manufacturing market in the East and a rapidly growing communications infrastructure upon which to build new economy are the ingredients to a powerful, and highly efficient continent. What do I have to do in order to receive the World Map for e-Invoicing?